Please submit your request for support. Helpdesk ticket submitted! We will be in touch soon. Reach far beyond the traditional 10/100 framework with the most robust solutions now available from “Ruckus Wireless” and “HP Procurve”. 24/7 Network Monitoring means maximum uptime for your customers and staff. Redwood provides VOIP and legacy PBX services specializing in lodging, multi-tenant and healthcare enviroments. As a “Mitel Hospitality Partner”, we provide outstanding Mitel sales and service. Next generation video security with server-based Video Management System utilizing megapixel (HD) IP CCTV cameras on converged networks. As a “Milestone Systems” authorized dealer, we provide superior VMS solutions for our customers. Our network solutions reach far beyond the traditional 10/100 framework to supply our clients with the most robust offerings now available from HP Procurve and Ruckus Wireless. These all-gigabit networks have no internal bottlenecks and, our HSIA headend and gateway server solutions measure 95+% pass through from the bandwidth provider to the client networks. These best-of-breed solutions deliver guest satifaction scores of over 90% for HSIA on a recurring basis. Please ask for references. Our in-house tier 2 and tier 3 helpdesk support is available 24 hours a day and comes with an average answer period of less than 30 seconds. No lengthy waiting periods for your guest support and, being connected to an in house support specialist means no guessing about the configuration or particular components of your specific network. We get your guest logged on and provide continued check in support for the duration of their stay with you. Satisfaction always sells more rooms. Our network monitoring and content filtering provisions allow us to provide the proactive support that Redwood has become well known for throughout the industry. No calls from your ISP threatening to take down your bandwidth due to peer-to-peer music and video file sharing. Redwood provides email relay and spam filtering which prevents the ISP from possibly blacklisting your property. These are just a few of the tremendous value added features you receive when you bring your data needs to Redwood. A full service Mitel partner since May 2002, we install and maintain the telecom assets of management companies, ownership and brands as a “Mitel Hospitality Partner” on a nationwide basis. Redwood provides intensive support for a multitude of systems from the original Mitel SX-200 through today's latest clustered, multi-site MCD offerings. Redwood Systems Group will design a custom services agreement to cover your software assurance and engineering fees thus eliminating the loss of investment returns caused by obsolescence and diminished performance. We ensure optimal performance of your technology thus allowing your guest and staff to leverage and enjoy your tech investments. Managed Service Agreements for voice, video and data. Increase your level of guest satisfaction by changing your voice video and data service needs to Redwood Systems Group. From our very beginning as a systems integrator we have focused on service to our clients. We understand hospitality and we know exactly what it is you need to make your business plan a successful one. Our 24 hour inhouse staffed tier 2 and tier 3 support specialist can assist you with any of your properties needs relating to our core competencies of voice pbx, hsia wired and wireless, and cctv video security. Redwood Systems Group has years of experience in helping healthcare and assisted living facilities reach their voice, wired and wireless data and security needs. We now have a large and growing number of facilities under managed service agreements and the list continues to grow. If your facility is in need of an experienced company with real hands on knowledge in this arena please contact us for a no obligation walk thru. Video Security is a core competency as both a vendor and systems integrator. Security for your property and for the well-being of your guest and employees is increasingly important. Redwood has the ability to work for your property in several different ways to provide you with the most cost efficient solution while maintaining the goals for system renovation/replacement. Best of Breed video software applications allowing for facial recognition, license plate capture, or general monitoring of key inside and outside locations. Redwood Systems Group is on call 24/7/365 for your critical systems maintenance and repair. Fast moving projects with minimal leadtime? No problem, we specialize in fast turnaround for last minute projects. Although on a larger scale, The Allerton Hotel Chicago is a typical example of how Redwood can benefit an ownership group by supplying Voice, HSIA, and CCTV. These three critical technology functions are all supplied by a single vendor who has direct responsibility and answers for all 3 when called 24x7x365. The property loves the streamlined vendor quotient, the outstanding service and the cost savings of having a single vendor solution. We work with Corporately owned and managed properties and our biggest achievements are often when existing properties have been under the management of a “national provider”. As we walk in the door we see Band-Aids hanging everywhere. If you need a nationwide vendor who does competently deliver successful technology solutions look to us. 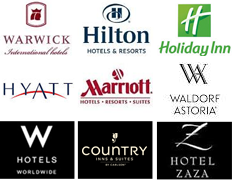 Our start with many of our clients was as a result of the growth of the Boutique Hotel Industry. From the PUBLIC Chicago by Ian Schrager to the WhiteHall Hotel Chicago we definitely have the solid experience to work with you on your independent hotel project. Our resort clients love our multiple core competencies because many of them are somewhat remote and a single vendor who can refresh and manage both voice, data and video is a big time plus for them. they get back to guest and managing a resort and we love helping clients achieve their goals. Customers appreciate the value and convenience of having a single vendor such as Redwood Systems Group to manage critical Voice, HSIA and CCTV systems across all properties and markets. Such a broad range of competencies is rarely found. We all now know after years of trying to make the smartest investments and most well thought out strategies that it is just not possible to future proof a property. However, it is possible with a proven winner like Redwood to secure an IT solutions provider that gives you as good a shot as any out there. Our sheer strength from years of experience in technology applications suitable for lodging institutions of all types make us a sure footed partner in times of technology’s rapid moves forward. We’ve seen it all from the single computer kiosk that will do it all to the single Cat5 totally converged network back to multiple non converged networks. ©2014 Redwood Systems Group, LLC. All rights reserved.